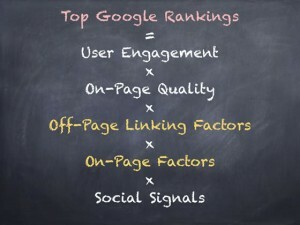 Have you any idea which Google algorithm update has affected your search engine optimization rankings? Google Panda & Penguin are very different. If your search engine traffic fell significantly on the 24th April 2012 then the launch of Google’s Penguin algorithm is the cause of your penalty. A large drop in search engine traffic near the 24th April 2012 indicates that Penguin’s off-page algorithm is the cause of your ranking penalty. You can’t make improvements to your search engine optimisation until you have an accurate idea of why your website has been affected. Penguin hits the over-optimized keywords hardest, so the most used keywords in your back-link anchor text will be the ones showing the largest ranking drops. The easiest way to analyse your back-link profile is to use majesticseo.com to analyse your links. The summary page will show you the anchor text volumes for each keyword. Prior to Google launching the Penguin algorithm, you could use up to seventy percent exact match keyword density and rank well, instantly this dropped to five percent. The bulk of your link anchor text really should be made up of Brand, URL or ‘junk’ link text instead of target keywords. Your website name or company name is a Brand link. Aim to use different variations of your website URLs, so your links point to an array of URL combinations, not all to exactly the same URL version. Getting links from various C Class IP addresses is very important for good search engine optimization rankings. Themed sites are powerful linking resources for you. Aim to ask for links from other sites that have a good ‘trust’ score. Google now looks to see who links to the sites that link to you, therefore, the neighbourhoods you mix with online tend to be more important than ever. This is an important part of your traffic generation activity, along with other internet marketing processes, social media marketing (Facebook & Twitter marketing), Adwords (pay per click) campaigns and viral promotion strategies. You should always avoid automated link networks because they generally produce only low quality back-links and when Google finds the network you’ll be penalized for the links within them. Link networks are lazy SEO and today offer no benefit to your website. If you have used an optimisation firm to create back-links, you should check whether they have used any link networks for your links. The Google web spam team are actively hunting down link networks and will penalise your site in SERP’s if you are caught using one. In addition to lowering the off-page keyword density through Penguin, Google changed it’s requirements for on-page keyword density too. Maximum keyword density on-page should not exceed 2 to 3%. Add an external link within your page content to an authority .gov or .edu site because Google likes to see external authority links. Your website pages should all have high quality, well written completely unique content. It is currently Google ‘best practice’ to link from inside your content using phrases in the text to other information pages on your own site or to external ‘authority’ domains. Your quality content works together with your web design to present your business as cleanly and concisely as possible. Videos and pictures are very useful content. Images are a great way to break up large areas of text and help to explain your site content. Videos are great for boosting the time that visitors spend on your site. Images within your page should contain unique ‘alternate text’. If you have more than one image on a page then the alt text should be different for each. Google can gauge the ‘reading age’ for your content and so can establish if it was written by a youngster or a professor. For this reason, spell check all your content and be sure it is grammatically correct. As a rule of thumb, target around 500 words or more for each page of content that you write as this has been proven to be beneficial for search engine results. Concentrate on your visitors when writing new content. You need your website visitors to engage with your content and to spend time reading it instead of hitting the back button. If people like your content then Google will too. You can write ‘natural’ sounding content using different words with the same meaning because Google uses latent semantic indexing (LSI) to associate related terms within your content. Online SEO tutorials will give you more in depth information about all of these important SEO metrics. Each page of your website ought to have unique meta data. Duplications show that your site isn’t the best quality and if you have a significant number of duplications you will be penalized. This is a demonstration that you have put care into your site. If you are not sure, ask seo-seo-seo.co.uk to carry out a full seo audit and you will find out everything that needs to be done to optimize your website. Duplications will be penalized, especially if you have lots. Write intriguing meta descriptions that will encourage a lot more people to click through from search engines and you will see a ranking benefit. Website load speed is a vital metric for good Google rankings. Check your websites load speed using YSlow in Firefox because if your pages take time to load you won’t rank very high. The bounce rate is the volume of traffic that hit the back button rather than engaging with your content. You must work to get this figure below 55% or you will be penalized in Google. Another big cause of a poor bounce rate is mobile friendliness, test your site for compatability at https://search.google.com/search-console/mobile-friendly?utm_source=psi&utm_medium=link&utm_campaign=psi-ux-banner&hl=en-US and if your site isn’t optimized for all screen sizes, ask cheapresponsivewebdesign.co.uk what needs to be done to make your site mobile compliant. Boosting the quantity of pages that your visitors look at is a good way of raising the quality score for your website content. Getting your targeted traffic to click through to a second or third page on your site is beneficial for your search engine rankings. Find out more about effective Inbound Marketing & how it will increase your sales from Deeho, the inbound marketing specialists. When Google sends you a visitor, it measures how long they remain on your site. Longer visits indicate relevance and a high quality website design that your visitors are engaging with.